Underwater Intervention is an industry conference and exhibition, jointly owned by the Association of Diving Contractors International (ADCI) and the ROV Committee of the Marine Technology Society. The exhibition is the world's premier event for commercial diving contractors, remotely operated vehicles, manned submersibles and all other aspects of the underwater operations industry. Unique System LLC (USA) is based in New Iberia, Louisiana and Houston, Texas. The company has achieved significant success over the years specializing in the supply of equipment for sale and rental to the diving and offshore industries in the Gulf of Mexico region. From New Iberia, Louisiana, the company offers diving equipment rentals and sales, saturation systems, new builds, refurbishments, project management and mining & construction tunnel boring machine airlocks. From Houston, Texas, our specialization embraces hydrographic survey rentals and sales. During the exhibition, Unique System LLC (USA) will showcase an array of products and services that represent each of the companies within the Unique Maritime Group. A few of these include the Unique Seaflex range of Buoyancy Products (Air Lift Bags, Water-filled Ballast Bags and Mono Buoyancy Units), Hydrographic Survey Gear, Diving Gear (Hot Water Unit, ICU, Scrubber, Fire Extinguisher, Sat System Model, LARS Model) and Unique Wellube range of services which include Hot Tapping & Line Stopping, On-Site Machining, Pipeline Rehabilitation, Under Pressure Leak Sealing, Pipeline Repair Clamps, Online Safety Valve Testing among many others. A prominent feature that will be showcased in our display of equipment is our range of UniFlex Air Lift Bags specifically designed for the US market. 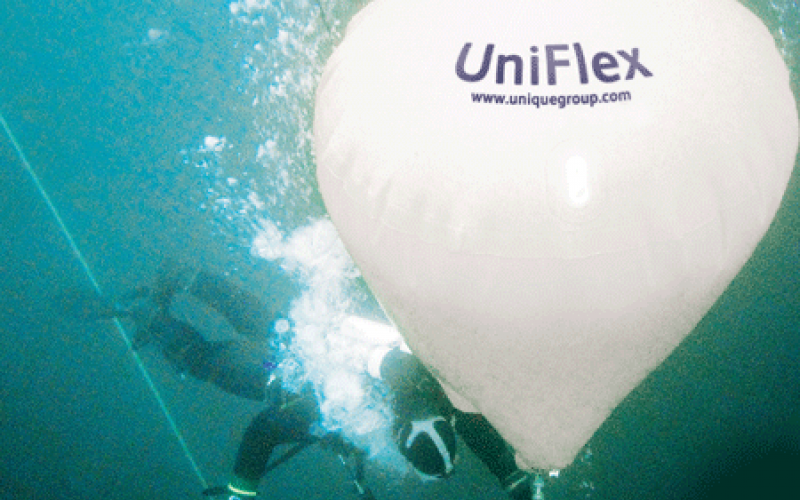 The UniFlex range covers the most commonly used sizes of air lift bags in the offshore industry (500kg, 1t, 2t, 3t and 5t) and have been specifically designed to meet the rigorous safety requirements of the now widely recognised IMCA Guidance D016. UniFlex Air Lift Bags have not only been designed with a 5 times working load limit safety factor built in, but each size has been physically overloaded by water filled drop test to verify that the minimum requirement is not only met but exceeded. Independent type test certificates are available for all sizes of UniFlex Air Lift Bags. They are also fitted with a robust inverter line attachment point which again has been function tested during full scale under water trials. No other manufacturer worldwide has gone to such lengths to ensure their products are fit for purpose, safe in use, made of the highest quality materials whilst maintaining a competitive price tag.